"There are only two reasons a nonseer would see a spirit on St. Mark's Eve," Neeve said. "Either you're his true love... or you killed him." It is freezing in the churchyard, even before the dead arrive. Every year, Blue Sargent stands next to her clairvoyant mother as the soon-to-be dead walk past. Blue herself never sees them - not until this year, when a boy emerges from the dark and speaks directly to her. His name is Gansey, and Blue soon discovers that he is a rich student at Aglionby, the local private school. Blue has a policy of staying away from Aglionby boys. Known as Raven Boys, they can only mean trouble. But Blue is drawn to Gansey, in a way she can't entirely explain. He has it all - family money, good looks, devoted friends - but he's looking for much more than that. He is on a quest that has encompassed three other Raven Boys: Adam, the scholarship student who resents all the privilege around him; Ronan, the fierce soul who ranges from anger to despair; and Noah, the taciturn watcher of the four, who notices many things but says very little. 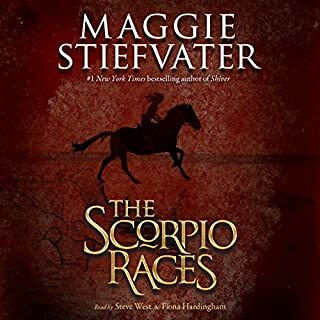 From Maggie Stiefvater, the best-selling and acclaimed author of the Shiver trilogy and The Scorpio Races, comes a spellbinding new series where the inevitability of death and the nature of love lead us to a place we've never been before. Although The Raven Boys is quite different from Maggie Stiefvater's Wolves of Mercy Falls trilogy and The Scorpio Races, it highlights her amazing characters, exciting suspense, and that intriguing sense that the words could almost be poetry. Each of the characters in this novel are both utterly deep and (despite the supernatural themes and plot) utterly real. For fans of Stiefvater's other works, this is expected. The bonus of this novel is that we get so many characters and yet can feel invested in all of them. Blue, Gansey, Adam, Ronin, & Noah (the most central characters) were especially wonderful because they were neither wholly good nor wholly bad. Each had his/her own idiosyncrasies and failings as well as moments of heroism and compassion. I fell in love with all five! I'm not generally a fan of the supernatural genre, but this story had me mesmerized and on the edge of my seat. I would have listened straight through if it weren't for those pesky distractions of sleep and work. 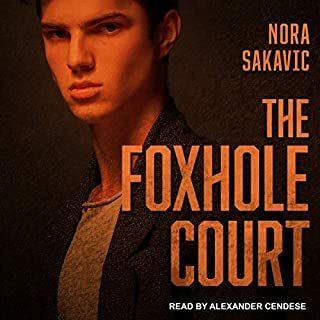 You can tell that this is the beginning of a series ("The Raven Boys Cycle," according to the audiobook), but it does not end in an annoying cliffhanger. The prose itself is captivating. I'm not even sure how to describe it, really, except that you can tell that Stiefvater's writing style is influenced by her love of music. I highly recommend reading/listening to any and all of her works. Note about narration: Will Patton did an excellent job; he really brought the text to life! I wasn't sure if I would like his narration because I expected the narrator to be about the same age as the characters (late teens) and Patton is definitely much older. However, the 3rd person point-of-view and his engaging narration really made it work and, I think, added to the whole experience. This is my first outing with a Maggie Stiefvater book, and after reading some synopses on her other books, I think this was my best introduction to her writing. Stiefvater excels in many areas with this book. The story takes a little time to jumpstart itself. However, it is never dull, and it certainly lays the groundwork for a thoughtful story. Her handling of the supernatural elements are done in a way that could make them almost believable if placed in a real world setting while retaining that magical allure. She’s taken typical genre tropes, such as the “rich boy meets poor girl” and the “tormented bad boy,”and weaved into these familiar stories a complexity and nuance that both young adults and adults can appreciate. While I would’ve enjoyed just a little more depth of character for some of her characters, she does a fair job of presenting characters that you care about, characters that have their flaws and strengths. You love them. You cheer them. You get angry with them. One thing that kind of irked with me with the story, as far as character is concerned, is that the main antagonist felt so weak in the grand scheme of the story. This person had weak motivations, weak intentions, and no substance. I dislike antagonists that I can only feel apathetic toward at best. Antagonists should pull emotions from me I didn’t even know I had. Finally, as a history nerd and supernatural buff, the coupling of history and the supernatural kept my interest. This was almost Arthurian in a way without being about King Arthur. As for the narration, I have a bit of mixed feelings about Will Patton’s narration. I feel his voice is both perfect and imperfect for this book. I enjoyed the almost hushed tone he used for the overall book However, parts of the book are narrated so brilliantly and other parts of the book, his narration felt jarring, a clash of tone and words. Funny thing is I can’t say whether there were more brilliant parts or more clashing parts, but it doesn’t turn me off to the narration. This is probably just another case of a narrator that I need to spend much more time with before I decide if I truly like them or not. One high praise I have for him is that I enjoyed his Southern accents, which I can be really finicky about as a Southerner myself. In fact, I enjoyed most of the voices he did for the characters in this book. This book was quite a pleasant surprise, I didn’t expect to get as involved with as I did, especially since I wasn’t drawn to this book. However, the books I don’t feel any particular way about are usually the ones that manage to really capture my interest and imagination. Stiefvater has created something amazing with this story, and that ending certainly prods readers to seek out the next book. The Raven Boys made me feel exactly what I want to feel when I start a new book. That magic of not being able to put it down. The ignored glances at my alarm clock when I notice it's past three AM. The heart wrenching pain when I become so obsessed I forget that these are just fictional characters. The Raven Boys is the best book I've read since The Name of the Wind. This completely unique story is about a girl, Blue, that lives in a house full of psychics. She is the only one in her family that does not have psychic powers, but instead possesses something much different. Blue amplifies the spirit's voices. This not only helps her family, but also helps the spirits in other ways. Blue is a little bitter that she cannot actually see the spirits, until one night she is able to see one. Then, of course, we have our raven boys who are in hunt of something that is much bigger than they are aware of: Gansey is the ringleader. Adam is from a broken home. Ronan has a lot of anger trapped inside him. Noah is carrying the biggest secret of them all. Basically, most all the raven boys are very privileged young men that go to an even more privileged college preparatory school. Blue tries to stay far away from them, or any boy because of a prophecy her mother has told her since birth, but their paths inevitable cross. I think that is the theme of this whole book: inevitability. How we all have choices, and how much that one small forgettable choice can change not only your future, but so many people's future. How that choice can make different paths cross, which in turn develops even more inevitable events. This is such a whimsical story, written so beautifully, filled with magic. The foreshadowing, the metaphors, the prose. Maggie Stiefvater is a God amongst men. I have nothing to compare it to, because it's incomparable. This book has everything I'd ever want in a story. This is the type of book that makes me feel guilty giving other books five star ratings, because this is deserving of something more, something that surpasses all the others. Hopefully this is a little better than my paragraph gush of Shiver, but I'm going to guess it's not by much. My personal opinion is that the blurb of this book does nothing for what the book actually is. So if you're holding off because of that, please give this book a try. Wow, so pleasantly surprised. Ready for more!! I was expecting a mildly entertaining semi-supernatural thriller. Wow was I off the mark. This book was not only well written, but the story has complex and real characters - even those who aren't "real" - the quest is really very interesting and based upon existing mysteries. The chemistry between all characters is fantastic and lets you become involved with all of them and their friendships. The prose is rich without being bogged down and wordy - you can SEE the situations and almost smell the woods or dusty apartment. I also read Tarot and am always fascinated to read stories involving characters who wear that skin being portrayed with dignity and respect rather than the charlatans and grifters they are often painted as. 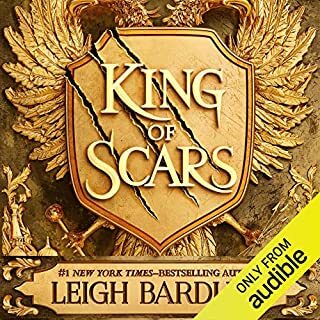 Yep, really liked this one so much more than I thought I would and was so happy that there are more in the series - I want more of this group and their quest for the King. Will Patton is one of my FAVORITE narrators - he always imparts class and so much honeyed Southern charm to his narration - love to listen! Thumbs Up all around!! I wasn't quite sure if this was a young adult book or not. I tend to think it is. However, even adults can enjoy this one. If you like paranormal, ley lines and mystery, you should like this book. Each major character is fully fleshed out, which gave me a reason to keep listening and rooting for them through out the book. Will Patton does an excellent job of narrating and bringing the characters to life. VERY GOOD STORY, AMAZING PERFORMANCE ! As an audiobook listener, surely you must have had that feeling that a narrator is just right or not for an specific book. In THE RAVEN BOYS the performance is so right that gives the characters a kind of depth, it takes you into the story and makes you jump or sight with relief. The story itself is good, an interesting and new approach to magic and to the supernatural interweave with the protagonists mundane thoughts, feelings and lives. Always good and evil fighting to prevail in the human soul. The combination of the story itself and its masterful performance kept me a bit anxious and not being able to stop the listening unless absolutely necessary till the end ! I know my review is over simplified but others before me have already said a lot with which I agree.I only want to insist that it is a very enjoyable production and worth your time and credit! Aahh and a very nice surprise is the music, which i liked it, is composed and executed by Maggie Stiefvater. Since I read this series back to back without time to write individual reviews, I'm summing up the whole series in one review. Lazy? Guilty as charged. Book 1 - 3 stars. It was different and though set in real time, easily drifted into fantasy time. Book 2 - 3 stars. Possibly the one I enjoyed most in the series. The concept of a dream thief was fascinating. Plus, loved the action. Book 3 - 2 stars. What happened? New characters were overwhelming. Something I overlooked in the other books - dialogues that left things unsaid as well as confusing dream sequences - really irritated me in this one. Book 4 - 2 stars (maybe 1.5). This could have been a trilogy in my opinion. This last in the series dragged. Again, why are all these new characters not fundamental to the tale of the foursome? I was hoping for lots of action to resolve the story but it lacked for me, regretfully. Narration - 5 star across the board! I am not drawn to books about the paranormal, but like many other adults I have enjoyed high quality books categorized as young adult, such as Hunger Games and Harry Potter. Having spotted this on a best of 2012 list, I downloaded it before a long drive. The writing is lovely, with such care and precision paid to descriptions of mood and feeling that the result is deliciously spooky. Serious and thoughtful, the author explores friendship, fate of birth and consequences. The paranormal events are used effectively, not to evoke disgust/fear or otherwise titillate (my general criticism of the genre), but to add gravity to each character's actions and to their relationships to each other. Understanding this makes it a little easier to accept the slow-ish pacing as you take time to get to know the principles. It ends satisfactorily but clearly is the first leg of a longer journey these characters face. 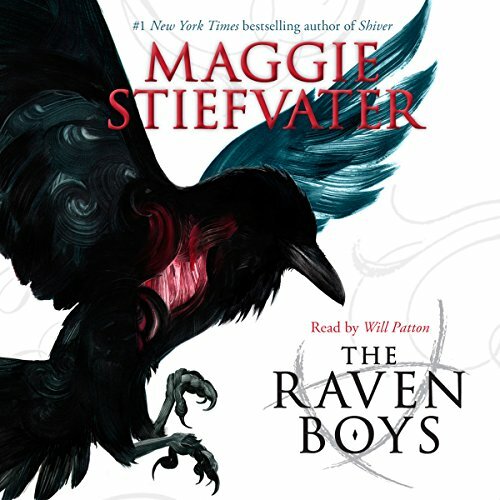 In the Raven Boys world, it is easy to believe in ghosts and magic in part because they are introduced so naturally and matter-of-factly that they lay beside the greater meaning of characters working hard to identify their moral compass and reconcile their values and actions with the circumstances of their lives. Surface cliches - rich boy/poor girl - are freshened by insights into each character's inner thoughts which are complex and considered. Blue's cursed fate to kill her one true love felt like contrived drama when first introduced, but the question of how and who she will love does not at all. I find I want to read more not to see what happens in a plot-driven sense, but to find out what happens to these characters. How do they grow up? Who do they love? What becomes of their friendships? For me, that makes this a five-star story. I have no idea whether those looking for innovations on the paranormal genre will find what they are looking for here. But if you love characters full of youth and potential, you will enjoy this. The narrator does a great job, inserting gentle southern drawls at just the right moments. Characters voices are distinct. The reading as a whole creates the feeling of a great campfire story. Please, Ms Stiefvater and Mr Patton, continue! We will meet again in THE DREAM THIEVES! 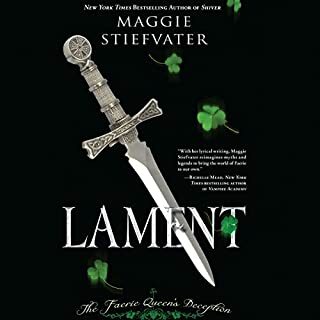 I’m a huge fan of Maggie Stiefvater’s THE WOLVES OF MERCY FALLS trilogy, and I recently listened to SINNER in audio which is what prompted me to give this series a whirl. Well, that and the fact that I won a copy. The author’s lyrical writing style that I’ve come to know and love was out in full force, I connected remarkably well with all of the characters after only one installment, and I also really liked that this wasn’t your typical paranormal listen in that it doesn’t feature the usual supe suspects. 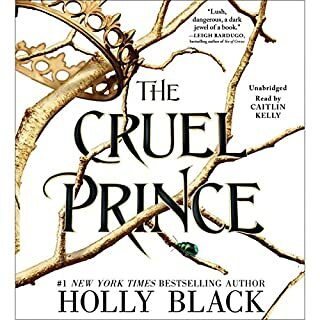 However, I found that the lore was a lot to take in—I had to listen to several chapters more than once in order to grasp all of the intricate details—and, I wasn’t completely sold on the narrator’s delivery. But, I remember not having instantly clicked with SHIVER, so I’m more than willing to give THE DREAM THIEVES a chance, I just won’t be downloading a copy asap. 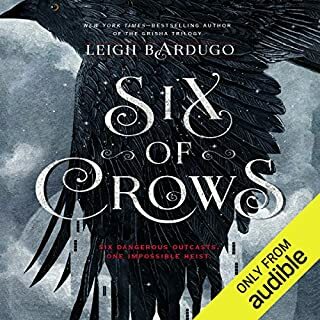 The first few chapters were kind of meh because all of this series’ players were introduced, but Stiefvater didn’t connect the dots until three hours in which caused THE RAVEN BOYS to have a rather slow start. Then all of the symbology, Tarot aspects, and Welsh lore kicked in, and I was once again swept again by this author’s masterful world-building skills. Readers are left with way more questions than answers, however that’s to be expected from a debut installment, so even though it was frustrating, I was still pleased with the end result. I’m infinitely curious about the corpse road, ley lines, Cabeswater, Glendower, the dreaming tree, and what it all means because at the moment there seems to be many MANY pieces to this puzzle, and I don’t have two clues as to how they fit together. I took an immediate liking to all of the characters; from Adam the trailer park trash trying to make it on his own, to Gansey the wealthy adventurer that attempts to be middle-class but fails horribly, and Blue the only non-psychic among a family of fortune tellers who just wants to be special too. The prophecy surrounding Sargent’s true love added an extra layer to the intrigue, then there was Whelk & Neeve’s individual motivations, and the whole possibility vs reality angle. And, just when I thought that I was beginning to figure the story arc out, Stiefvater goes and drops the Noah bomb on me, followed by multiple visions of likely outcomes, and a semi cliff hanger ending about a ghost’s dreams and a raven named Chainsaw. Colour me thoroughly confused! I liked Will Patton’s narration, but I didn’t love it, and there were a few reasons why. The main one being that he whispered a lot, and although I found that it fit this novel’s darker tone, it also made him difficult to understand. The whole time I was listening, I thought that Cabeswater was actually caves water, and this happened for several words that I later had to look-up in order to write an accurate review. This also may have been what caused me to have to re-start several chapters rather than putting all of the blame solely on the author’s complex world-building. I really disliked the voice he used for Persephone, and for the most part, he felt too old for a Young Adult book. However, after eleven+ hours of him streaming through my earbuds, he did grow on me, so I’m not prepared to write him off just yet. THE RAVEN BOYS made me go WTF way too many times to count, as all good mysteries should, so mission accomplished Maggie Stiefvater. We will meet again in THE DREAM THIEVES! It took me a while to get into this and to get used to the narrator but once I did the story started to grip. There were some moments that were genuinely eerie, particularly when listening at night, and I liked the combination of the mythical and the everyday. The background and characters really grew on me and I'm keen to hear what happened to them next. I really liked the way Will Patton narrated the various third-person Point of View chapters using the voices of individual characters. It was unusual to hear a characters voice read in third person, and it was very effective. There are a couple of jarring moments in the reading, though I think those were more the fault of the director, and not the reader. A couple of times Will's voice was layered in some of the areas where characters are speaking simultaneously. That was a largely unnecessary conceit though, admittedly, a minor quibble in an otherwise faultless reading. Many. Though I would hate to spoil the book for others by mentioning specifics. I read the book before listening to the audio version, and I think I actually appreciated the audio version more as a result. The author's facility with language is a real joy to experience on the page, and is even more enjoyable as a listen. This is one of those rare novels where character, story and language add up to more than the sum of their parts. Couldn't wait to dive into book two after listening. Loved this audiobook, Maggie's stories are always the best and this is no different. Can't wait for the next instalment in the series! My only issue was some of the accents were a bit jarring as they switched between characters and they weren't always consistent. I chose this book because of Will Patton as I've enjoyed his narration in other audiobooks. He has a voice that evokes and enhances sublimely bringing Maggie Stiefvater words alive such that they surround you to the point of sharing the same space as the characters. I was half way through the first of the series when I realised this was a 'young adult genre' book. (I'm nearly 60) It is one of the most beautifully written books I have ever read/listened to. The language. The descriptions. The storyline. The characters... and that voice, so velvety smooth, a little like Matthew McConaughey. The five main characters are built and expanded upon with great creativity and the supporting characters are as equally important to the story line and are not throw away or two dimensional. I don't want to give anything away here so I am being deliberately vague so as not the spoil the listen. I'm open to many genres and usually listen to thrillers and crime, so to find a gentle yet eerie, gripping 'fantasy' tale of this quality in a young adult book is a gem. I would say give it a try. You'll be very pleasantly surprised. Will Patton could read a restaurant menu and make it compelling. So the story was a gamble, would I enjoy it? Oh yes indeed! Brilliant story from start to finish and I most definitely will complete the series. There wasn't a moment I didn't enjoy. The author has a new fan. I really enjoyed this book. The narrator does an excellent job at giving each character a distinctive voice and speech pattern, so much so I often forgot it was just one person. The story is original, layered and best of all managed to surprise me, a delight. I'm looking forward to the next book in the series. The characters in this book are so well rounded that I wasn't sure who I liked at first, except for the protagonist, Blue. It was compelling reading or in this case listening and I am greatful that the author has written more books. The book is absolutely amazing! I've never been so drawn to a book ever! It grabs your attention by throwing in twists and turns. With fantastic imagery. And Will Patton did the book justice with the reading. I have loved every other Maggie Stiefvater book I have ever read, especially The Scorpio Races, but I think this is my new favourite. Excited to download the rest of the series. What made the experience of listening to The Raven Boys the most enjoyable? I think there is probably a bit of a list. The story has such whimsy, lightness to it. The language and poetic way that Maggie Stiefvater, while after a while can be a little bit repetitive, I still love it. Which character – as performed by Will Patton – was your favourite? Ronan. He's gravelly and agressive. Will Patton probably only falls down a bit on one narration, and that's Calla, but Ronan really is portrayed well as cutting and angry. This is a book that when I'm out of reading material, I come back to and listen to over and over. The last book for the series is about to come out and so I'm starting back at the beginning. I haven't read a book like this before. it started off slow but got very interesting towards the second half. can't wait to find out what happens next! Such a good plot and we'll written. It made me happy to see a realistically quirky main girl. Also, I am infinity happy to see Tarot done right in media for once. I've always love Maggie's writing, and I'm more in love after hearing this one. It's so captivating. Will Patton did an excellent job at reading, I was transfixed from start to finish. Overall wonderful experience, can't wait to read the next book. I will know in future to Google a book not take it on your reviews.